Flooding is an ever growing threat to homes in the UK, and its effects have already proven devastating. If you live in a risk area then it is important to be prepared because when it happens it’s already too late. Do I Live in a Flood Risk Area? Brits have always enjoyed a good moan about their fickle climate, but the talk is taking a darker tone now the weather has started to pose a greater threat than a spoilt wet weekend at the beach. It is estimated that around 5 million people, occupying 2 million households, currently live in the flood risk areas of England and Wales. If you are unsure whether your home is threatened by sea or river flooding then you can check on the Environment Agency website by simply entering in your postcode, or alternatively by calling Floodline on 0845 988 1188. Despite concerted efforts by the Environment Agency to raise flood awareness, a great many people are still unaware that they live in a flood risk area. How Will I Know When a Flood is Due to Occur? Both the Environment Agency and Floodline are also on hand to provide up to date flooding information. The Environment Agency offers a 24 hr flood alert system for those who live in the flood plain. Residents in this high risk area can sign up to receive early warnings by phone, text, email, pager or fax. In some areas loud hailers and sirens provide an on the ground warning system. It is vital that you understand the four different flood warning types. These can be issued in any order and once passed, will be followed by the ‘all clear’. Flood Watch – Flooding of low lying land and roads is predicted. Flood Warning – Act immediately! Flooding of homes, businesses and main roads is anticipated. Severe Flood Warning – Act immediately! Severe flooding is due and poses a serious danger to lives and properties. All Clear – No further flooding is expected. The water levels will begin to drop. Beware whether all is safe to return home. Having your home devastated by a flood is traumatic enough, but to then discover you are not properly insured would be devastating. For information about insurance companies in your area, you can contact the British Insurance Brokers’ Association. If you are unsure how well your home insurance covers the effects of flooding then it is advisable to contact your insurer for advice. They will likely expect you take some reasonable steps to protect your property in return for their coverage. 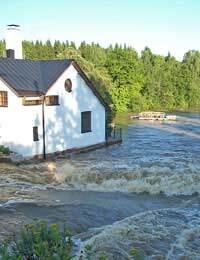 In the event of a flood warning, such defensive measures would include moving all easily moveable objects upstairs, using sandbags to hold back the water and switching off the electricity supply at the mains. It is advised to at all times keep all insurance policy documents and emergency contact numbers safe, such as in a waterproof plastic bag or a glass jar with screw top lid. Public concerns were recently sparked when some insurers threatened to cancel policies unless the government paid up for national flood defences. Fortunately the threats have subsided now a programme of flood defence building has begun. It is hard to predict how we will act when faced with an emergency situation, particularly one that presents a threat your family and your home. It is wise to not risk finding and to instead prepare an emergency flood plan. By preparing an emergency flood plan in advance, you are able to sit down and calmly work out what you need to do when the flood warning sounds. The plan should include an escape route and emergency contact numbers. In preparation it is also worth contacting friends and family to see whether they would be able to offer accommodation if disaster struck, and also considering how pets will be protected. If you are disabled then local social services will be able to help out with your escape plans. A torch with fresh supply of batteries. Waterproof clothing, as well as a pair of rubber gloves. A store of non-perishable food items. A stock of bottled water. A portable radio with fresh battery supply. It is also a good idea to get into a habit of keeping sentimental or very valuable items upstairs in the property, or at least in a high place downstairs. Who can Help in a Flood?